4 Great Audrey Hepburn Halloween Costume Ideas! Do you want to channel a stunning starlet and Hollywood icon for your next theme party or Halloween event? Here are Four incredibly glamorous Audrey Hepburn Halloween costume ideas – plus everything you need to successfully piece together each look. We’re gonna make you look good! 1 AND Happy Halloween to all the Audrey Hepburn Fans! In the film, Audrey wore a floor-length sleeveless gown. However, if you can’t find a dress in this style or it doesn’t look quite right on your body type, just about any “LBD” (little black dress) will do. You can buy a dress online… HOWEVER, I do not recommend it! Especially if halloween is coming soon because what if the dress doesn’t fit… maybe it is too loose, or too tight? I think your best bet here is to go down to your local macy’s or other department store as there are tons of black dresses to choose from. Audrey rocked black leather pointed-toe pumps in the film. However, the shoes aren’t really the statement-making aspect of this costume. So if you already own round-toe pumps or sling-back sandals, they will work just fine… as long as they’re black! If you’re a girl, which I’m trusting that you are, then you’ll more than surely have a pair! If not, go down to payless shoe store and grab some cheap ones for $15 – $20. Go for a pair of elbow-length black gloves. Not sure where to find them? Check online retailers like Amazon, costume shops or maybe try to scoop up a pair on sale after prom season at your local department store. Definitely check out my Audrey Hepburn sunglasses article. In the 1960s, oversized frames were in fashion. 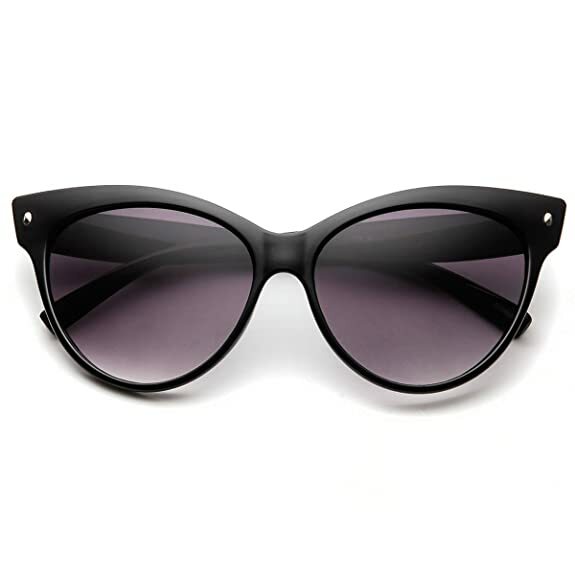 So to accurately recreate this classic look, opt for a pair of large black sunglasses with light gray or purple lenses. 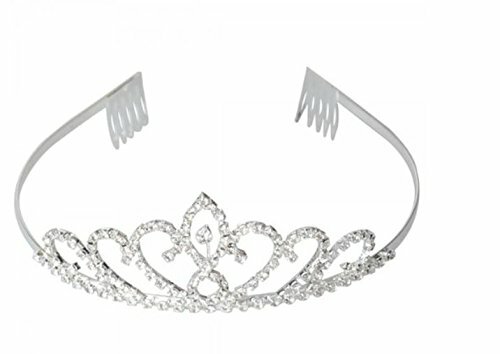 The crown jewel to complete this Audrey Hepburn costume idea is obviously the tiara. This is a small (but not understated) silver headpiece with rhinestone accents. You should be able to find something similar at a costume shop or a women’s accessories specialty store. 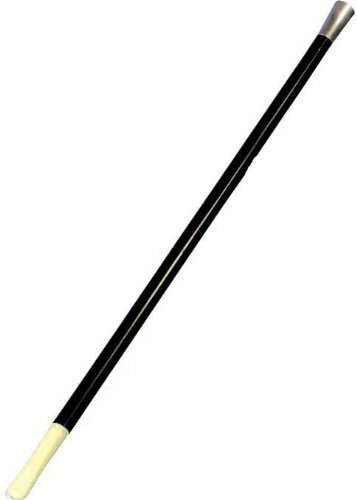 This isn’t a real cigarette holder, but it does the job! Now I’m not condoning to smoke because it’s very unhealthy for you. Audrey did smoke a lot on screen and off screen. So for those who want to leave this part out of their costume, that’s totally up to you. I think it completes the whole set up though. This is a pretty convenient set offered by the lovely people at Utopiat who do a wonderful job at curating Audrey items for retail. This is a really easy look to pull off but you need the accessories. I think the hardest thing to get here is the sleep mask. 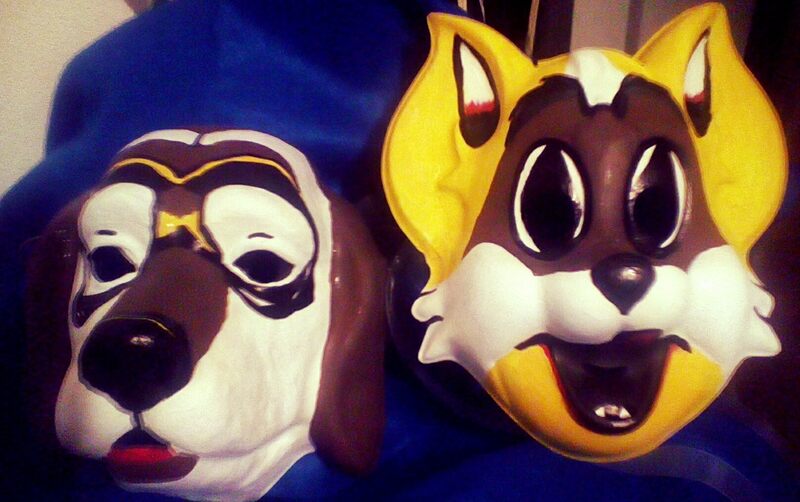 the sleepmask can be made by you or if you don’t have the time, ETSY has a lot of cute masks for sale. 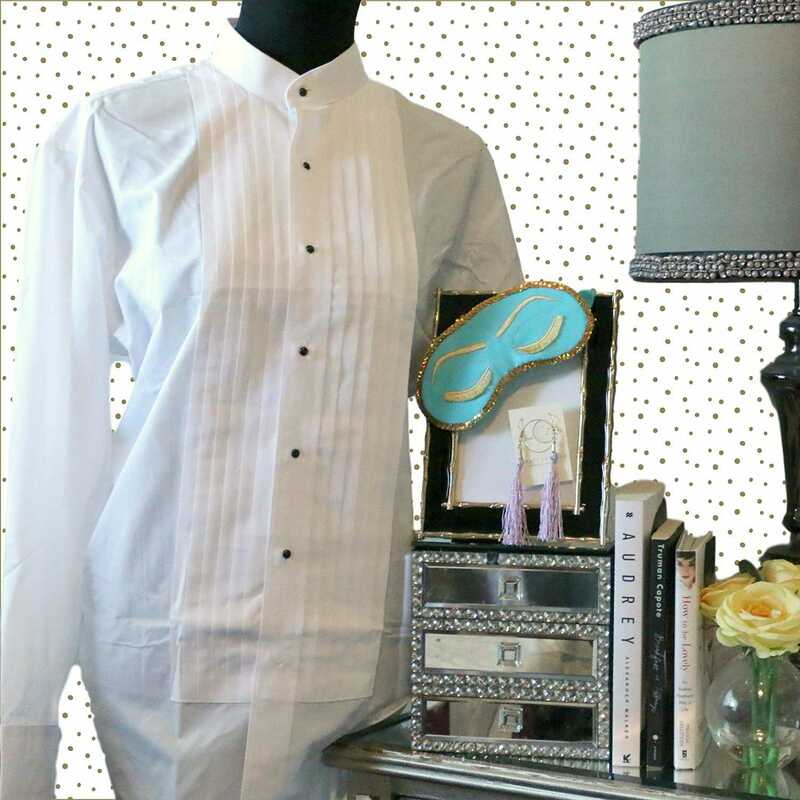 Large Tuxedo Shirt or White shirt – Get the entire costume here! Sleep Mask – Find this mask here. Pink-Orangey Lipstick – THIS ONE is same one Audrey used! Ear Plugs with Fancy Tassles – Easily find these here. Before the miniskirt was introduced, long A-lines cuts were the standard in the early 1960s. Pick one that sits at your waist and is approximately mid-calf in length. 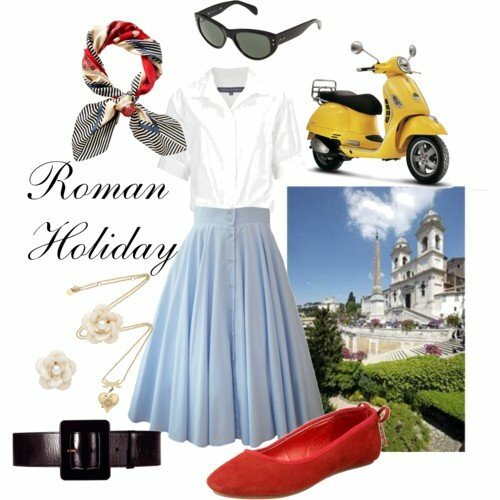 The color of the skirt doesn’t really matter here because “Roman Holiday” is best remembered as a black and white film. 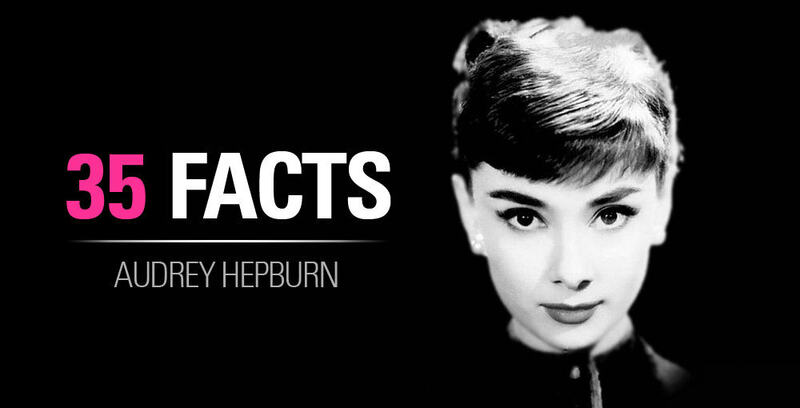 Audrey Hepburn is famously recalled for her slender frame. You can accentuate the smallest part of your waist by donning a wide belt close to the color of your skirt. In “Roman Holiday,” Audrey wore a white collared button-down with a little bit of volume in the shoulders. If you don’t want to spend the money to buy a brand new white collared shirt, try a short-sleeved plain white tee instead. For her character’s fashionable vacation ensemble, Audrey was dressed in brown sandal wedges with crisscross straps. However, the shoes weren’t really the focal point of the look – so anything you own that is neutral in color and comfortable would be an appropriate substitute. 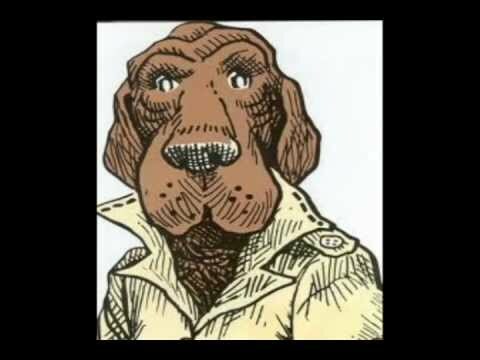 Don’t forget the neckerchief!! a small printed scarf that is tied around the neck and carefully slanted to one side. The neckerchief is crucial to establish the time period and it really pulls together the whole look. Neckerchiefs aren’t in fashion anymore but can still be found online easily or in thrift stores. Everyone loves Jo Stockton, the kooky bookworm turned fashionista. I love it when she’s dancing in the night club in France, a spectacular performance. Lots of people have copied this SIMPLE LOOK including Kim Kardashian whether you love her or hate her! Pony Tail w/ Bangs – CHECK! AND Happy Halloween to all the Audrey Hepburn Fans! 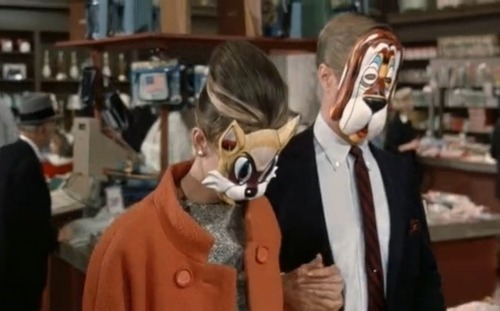 Looking for some Halloween ideas this year and you’ve inspired me to be Holly Golightly! 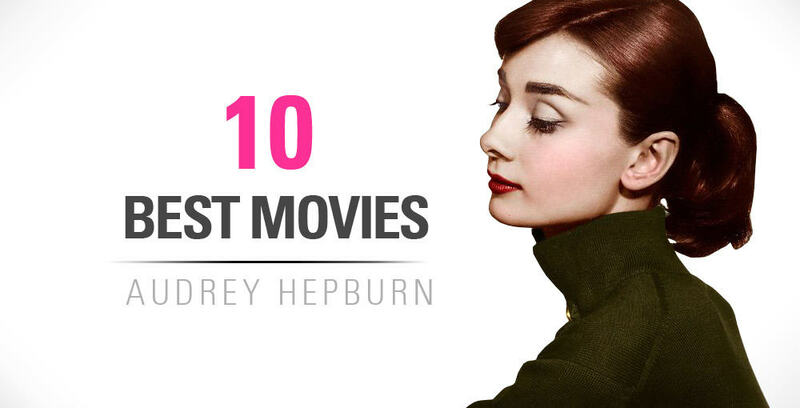 I knew about all the other ones except the bed time holly golightly! Great idea and simple! Glad that this helped you Ericka!